Selepas keputusan pilihan raya pertengahan musim 2006 , Presiden George W. Bush telah mengumumkan pencalonan Gates untuk menggantikan Donald Rumsfeld sebagai Setiausaha Pertahanan Amerika Syarikat pada 9 November, 2006. Gates telah menyatakan di dalam suratnya kepada para pelajar bahawa beliau akan menyambungkan tugasnya sebagai Presiden Texas A&M sehingga selesai proses mendapat kepastian process. Gates akan menghadapi dahulu kepastian daripada Jawatankuasa Perkhidmatan bersenjata, dan sekiranya diluluskan, oleh satu undi majoriti di dalam undi vote in the Senate. A native of Wichita, Kansas, Gates attained the rank of Eagle Scout in the Boy Scouts of America and is a recipient of the Distinguished Eagle Scout Award from the Boy Scouts of America. He graduated from Wichita East High School in 1961. Gates then headed east to attend the College of William and Mary where he graduated with a B.A. in European history in 1965. While at William & Mary, Gates was an active member of Alpha Phi Omega, national service fraternity, as well as active in the Young Republicans and the business manager for the William and Mary Review, a literary and art magazine. At William & Mary, Gates was named the graduate that "has made the greatest contribution to his fellow man." Gates then went on to receive a master's degree in history from Indiana University in 1966, and a Ph.D. in Russian and Soviet history from Georgetown University in 1974. ^ Robert Gates, From the Shadows: The Ultimate Insider's Story of Five Presidents and How They Won the Cold War, Simon & Schuster; Reprint edition (May 7, 1997). ^ "Gates' Government Intelligence Experience Runs Deep". National Public Radio. November 9, 2006. Dicapai 2006-11-09. ^ "Bush replaces Rumsfeld to get 'fresh perspective'". CNN.com. November 8, 2006. Dicapai 2006-11-08. ^ Whitson, Brian. "Gates ('65) nominated as defense secretary." College of William and Mary. November 9, 2006. Retrieved on November 9, 2006. 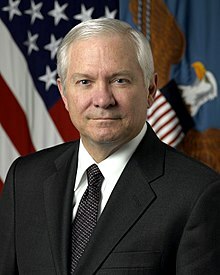 Wikimedia Commons mempunyai media berkaitan: Robert Gates. Laman ini diubah buat kali terakhir pada 16:10, 30 Mac 2013.